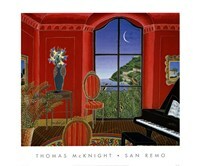 Thomas McKnight (Born 1941) is an American artist born in Lawrence, Kansas. He discovered his artistic talent at the age of 13 after his mother gave him some oil paints with which he made his first painting. He's renowned worldwide for his paintings and posters that position him within an elite class of artists whose works have their unique signatures. 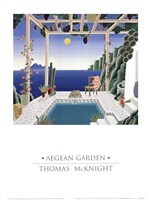 McKnight’s artworks are rich in both color and image. Whether it's a painting of landscape, interiors, animals, miniatures, or whichever subject, McKnight works remain easily recognizable. He was among the only five students who majored in art at the Wesleyan University in Middletown, Connecticut. McKnight had a short stint at Columbia University where he studied art history. Beginning 1964 and for a period of 8 good years, he worked with Time Magazine. In 1972, he left the Time Magazine and started painting more seriously. McKnight got married to his wife Renate in 1980. That year was full of successes as he created limited edition paintings that increased his popularity. The year 1988 saw McKnight's print Constitution picked as the US Constitution Bicentennial's official image. Later when Hillary Clinton was elected president, the Constitution print was among the arts that his wife Hillary Rodham Clinton chose to bring along to the White House. In 1993, McKnight was commissioned to create a series of paintings for the city of Kobe, Japan, for the celebration of the city’s tricentennial. This led to one of his works being featured at the Kobe Art Museum. In 1994, the White House commissioned McKnight to paint a Christmas card. About a million of cards bearing that painting have been sent by the White House to different entities. His works are displayed in Smithsonian Institution and Metropolitan Museum of Art in New York. 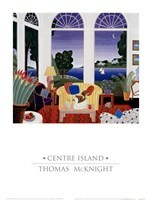 McKnight and wife are currently residents of Litchfield, Connecticut, where he still creates artistic works.